The name on his business card said; “Wile E. Coyote”. The job title said “Genius”. I pressed the record button on my video recorder that signalled the start of my long awaited interview with Mr Coyote. Mr Coyote: “If I only knew then what I know now, but experience is indeed a most valuable resource that can’t be bought, or rushed. I will try and summarise my learnings into two key points so as to make it easier for your readers to understand. Point 1: I’m actually a vegetarian, but didn’t know this at the time of my Road Runner chases. Apparently my metabolism can’t cope with meat. I wasted years of my life, thousands of dollars on birdseed, explosives and online purchases from the ACME Company for products that served no benefit to my ultimate nutritional well being! Point 2: Sit back and take the time to learn from your mistakes. If I had only sat quietly in the cinema and observed all my cartoons, I would have seen an accumulation of consistent errors. Unfortunately, it was like someone had pressed the delete button on my memory as I’d always forgotten what I had learnt from each Road Runner pursuit. I could blame the brothers Warner for this, but I only have myself to blame as I was more focused on my “Super Genius” status as was quite prevalent with most Hollywood movie stars of that era”. We talked for another couple of hours about his life, his romances, and his colourful and very animated life and then departed as good friends. It was a most enjoyable interview. As I was writing up my notes for my editorial, I recalled his words about the “delete” button. How many of us quickly delete failed life experiences, phone conversations, writings, presentations, memories and other forms of people interaction? Why do we not welcome the opportunity with a positive mindset to move forward and to ensure our steady progress? 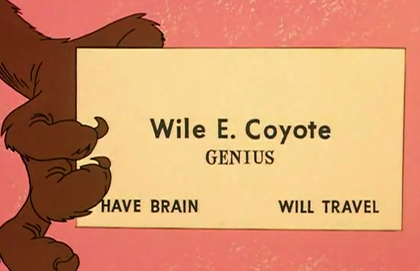 Yes, Mr Wile E. Coyote was indeed a real Super Genius…..